The Copper Canyon region is one of the most remote parts of Mexico. This remoteness helps to explain why the area is the home of about 50,000 Tarahumara Indians, and how they have managed to preserve much of their highly distinctive culture to this day. The Copper Canyon railroad line, “the most dramatic train ride in the Western Hemisphere” (Reader’s Digest), begins in Ojinaga and continues, via Chihuahua, to Los Mochis and Topolobampo. 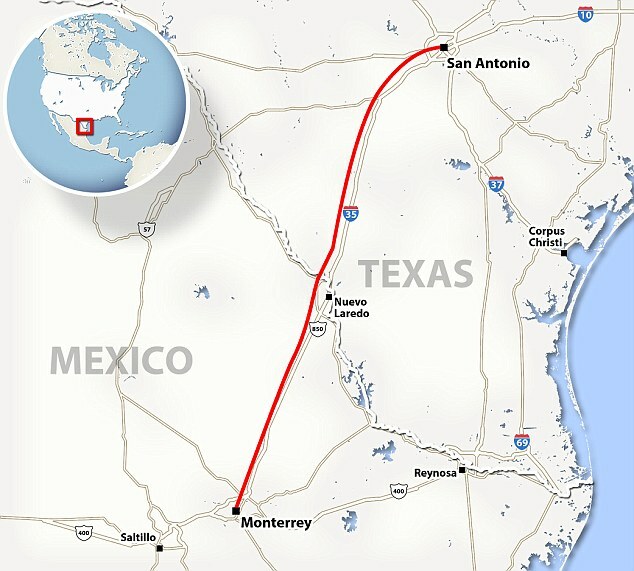 The railroad was started in the 1870s to enable produce grown in southern Texas to be exported via a Pacific port. Simultaneously, the twin settlements of Los Mochis and its port Topolobampo were developed on the other side of the Western Sierra Madre. The railroad project floundered and successive attempts to complete it all failed. Some innovative engineering finally led to the line being completed in 1961. Total cost? Over $100 million. The highlights include a 360-degree loop at El Lazo (km 585 from Ojinaga), one of only three comparable examples anywhere in North America), and a 180-degree turn inside a tunnel near Temoris at km 708. The line crosses the Continental Divide three times, reaches a maximum height of 2400 m (at km 583) and skirts the rim of the Copper Canyon. 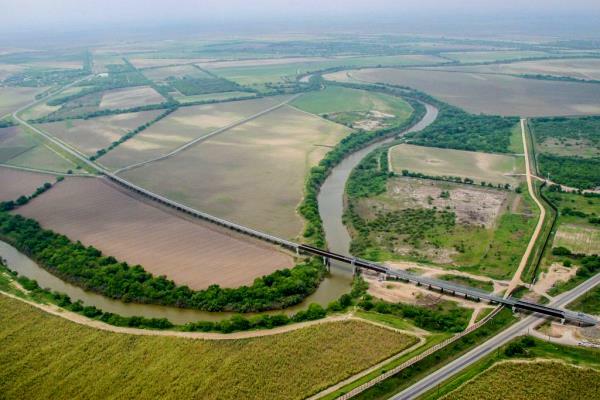 Between Chihuahua and Los Mochis, there are 37 bridges (totaling 3.6 km) and 86 tunnels (totaling 17.2 km). Almost all passenger rail services in Mexico ended in the 1990s but daily services continue along this line, mainly for tourists. Tarahumara Indians wait for a sale at Divisadero, the station on the canyon rim. Photo: Tony Burton; all rights reserved. Almost all trains stop for a few minutes at Divisadero, a station set right on the rim of the canyon, with a lookout offering a magnificent panoramic view. 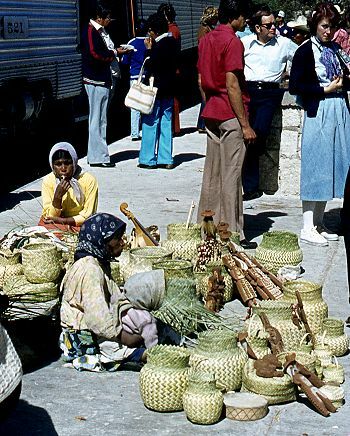 Shy Tarahumara women and children sit quietly, weaving pine-needle baskets (see photo) and hoping for a sale. Many of them speak very little Spanish apart from the numbers; on the other hand, how many tourists speak even one word of the Tarahumara language? Thirty years ago, most articles sold by the women were items similar to ones they would use everyday themselves in their daily tasks. Sadly, many of the articles sold today are made specifically for the tourist trade. Unlike the railway, Los Mochis and Topolobampo both soon flourished. Topolobampo was started by US engineer Albert Kimsey Owen who chose this previously unsettled area for a socialist colony based on sugar-cane production, and as the terminus for the railway. Topolobampo has one of Mexico’s finest natural harbors, a drowned river valley or ria, which affords a safe haven in the event of storms. Los Mochis was officially founded in 1893 by a second American, Benjamin Johnston, who built a sugar factory there. Los Mochis became especially important in the second half of the twentieth century as a major commercial center, marketing much of the produce grown on the vast El Fuerte irrigation scheme. Much of this produce is still exported to the USA via the famous Copper Canyon railway. Los Mochis and Topolobampo are unusual—there are few other examples of such “new towns”, with no colonial or pre-Hispanic antecedents, anywhere else in Mexico. 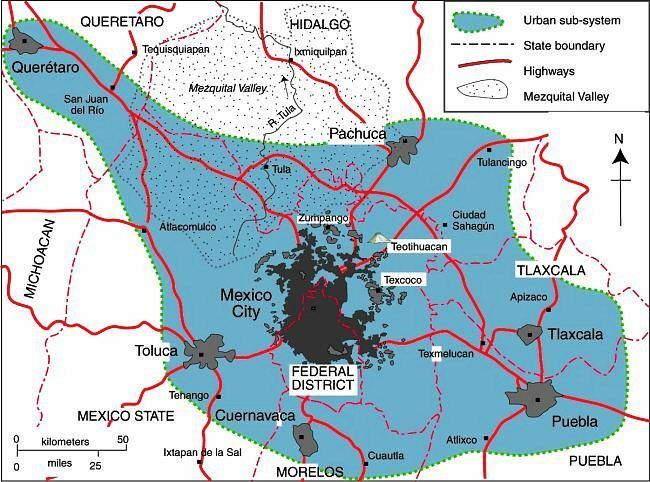 ﻿Chapter 10 of Geo-Mexico: the geography and dynamics of modern Mexico is devoted to Mexico’s indigenous peoples, including the Tarahumara Indians. If you have enjoyed this post, please suggest to your local library that they purchase a copy to enhance their collection. 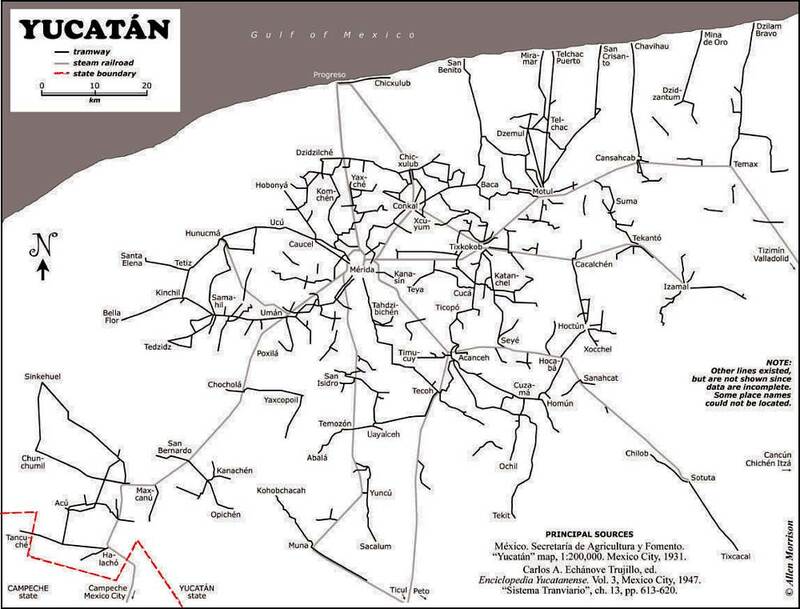 About 1900 one of the densest railroad networks on earth was operating in the Yucatán Peninsula. Between 1870 and 1920 the area experienced an economic boom based on the production of twine from sisal (oro verde or green gold). The numerous plantations in the area needed a way to move the sisal from the fields to processing centers and from there to ports for export. The plantation owners built a very extensive (4500 km) system of narrow gauge railroad system to move sisal as well as sugar and corn. 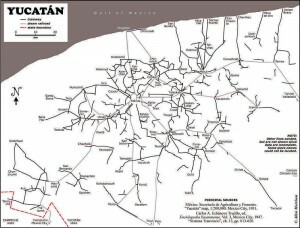 Map of Yucatan's railways. Copyright Allen Morrison. Reproduced by kind permission (see link to original map near end of this post). Click map for larger version. The tracks stretched up to 100 km in all directions from Yucatán’s capital, Mérida. Rolling stock and complete sections of track with steel ties were imported mostly from Europe but also from the USA. 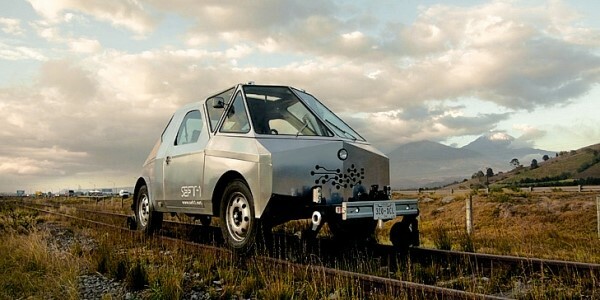 The small trains were powered by mules, steam engines, electric batteries, and later by gasoline motors. There was no standard design. Several different gauges were in use ranging from 400 to 930 mm (15.7 to 36.6 in). Foreign competition, the Mexican Revolution, and synthetic fibers brought an end to the sisal boom. Many of the plantations closed in 1930s. Soon small entrepreneurs were providing rail passenger services between the scores of towns in the area. Many families used the small sisal hauling cars as personal transport, powered by a horse or mule. This was far more efficient than animal drawn carts on the rough dirt roads, but required occasional de-railing to allow those going in the opposite direction to pass. Some of the Yucatán’s narrow gauge lines have survived into the 21st century, and some of the former sisal haciendas have reopened as luxury hotels for tourists. Acknowledgments: Grateful thanks to Allen Morrison, who generously allowed us permission to reproduce his excellent map of Yucatán railways. Mexico’s transportation systems are the subject of chapter 17 of Geo-Mexico: the geography and dynamics of modern Mexico. Buy your copy today! 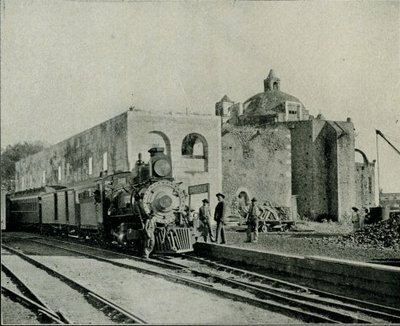 Yucatán’s main line railway was not linked to the rest of Mexico until about 1950. As mentioned in a previous post about tourist guidebooks, the introduction of railways into Mexico and the gradual expansion of the railway network encouraged the development of all kinds of social, industrial and tourist activities. 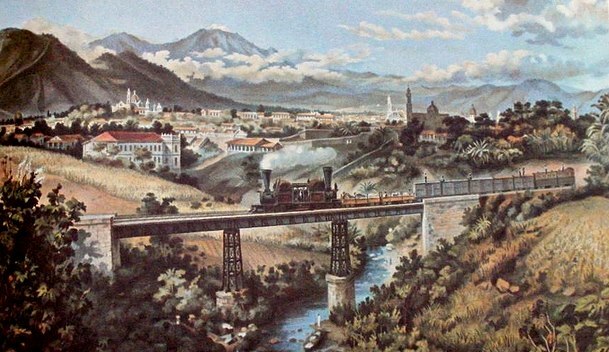 The Mexico City-Puebla line was completed in 1886 and went via the small town of Cuautla in the state of Morelos. Cuautla is about 25 kilometers south-east of Cuernavaca. In Cuautla, the builders of the railway found a perfect location for the town’s new station, very close to the center. They station was constructed around the cloisters of an abandoned building, the former Dominican convent of San Diego, which dated back to 1657. Its ecclesiastical life ended some years before parts of it were incorporated into the railway station in 1881. The Oldest Railway Station in the World. Cuautla. Inter-Oceanic Railway (from Carson). Cuautla is also famous for having the oldest railway station in the world, the crumbling, ancient structure which is now used for this purpose having been the Church of San Diego built in 1657. … The day after my arrival I went into the old church, the body of which is now used as a warehouse, while one side of it bordering the railway line provides accommodation for the waiting-room and various offices. A quantity of wine-barrels were piled up at the spot where the high altar had formerly stood, and all kinds of merchandise were stored in other parts of the building. Over the door was an inscription, the first words of which seem appropriate enough to the present condition of the once sacred edifice: “Terribilis est iste hic domus dei et porta coeli ” (How dreadful is this place. This is none other but the house of God and this is the gate of heaven). In October 1973, the original narrow gauge track from Mexico City to Cuautla was replaced with standard gauge line, bringing a premature end to the lives of several steam engines. These engines were among the very last steam locomotives used in regular service anywhere in North America. Fortunately, the oldest section of narrow gauge in Mexico, built between Amecameca and Cuautla still survives. Originally built in 1881 as the Ferrocarril Morelos (Morelos Railroad), it was partially re-opened, between Cuautla and Yecapiztla, for a tourist steam train service in July 1986, using engine #279 and four restored second class coaches. Engine 279 is a Baldwin locomotive, built in Philadelphia, first brought into service in 1904, and now spends most of its time resting contentedly in the Cuautla museum, the museum that is housed in the oldest building ever used as a railway station anywhere in the world. I am very grateful to Tony Smedley and Ian Jolly, two very alert railway enthusiasts from the U.K., for bringing to my attention the rival claims of a railway station building in Lincolnshire to be the oldest in the world. The original owner of Red Hall, in Bourne, died in 1633. The Hall was later used as the Station Master’s house and Ticket office for the Bourne & Essendine Railway, which began operations in 1860. The last passenger train through Bourne station was apparently in 1959, with freight services ending a few years later. (For more details, click on Red Hall and Bourne Railway Station respectively. Since the Red Hall (Bourne) station no longer has any rail tracks or trains associated with it, I stand by my claim (for now at least) that Cuautla station (which still does have rail tracks and trains) is the oldest railway station in the world. Apparently, Carson, at the time he was writing, was unaware of the rival claims of Red Hall. Campbell, Reau. Campbell’s New Revised Complete Guide and Descriptive Book of Mexico. Chicago. 1899. 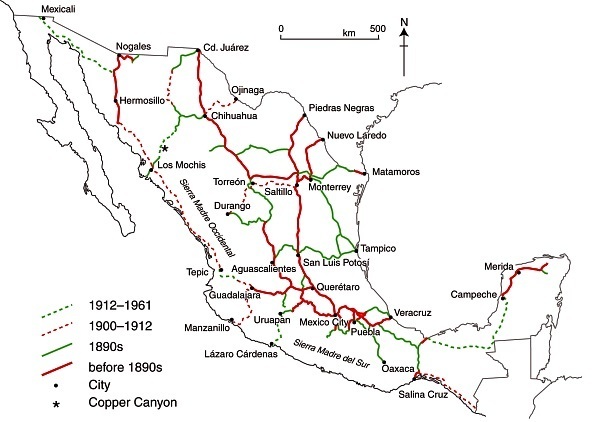 The growth of the railway network and the importance of railways in Mexico are examined in depth in chapter 17 of Geo-Mexico: the geography and dynamics of modern Mexico and tourism in Mexico is the subject of chapter 19.